When you’re daydreaming of a park view hotel in Bangkok with unbeatable panoramas, you’re probably imagining MIXO. A rooftop bar in Bangkok MIXO is not, but then again, which al fresco spot serves up views as these come rain or shine? 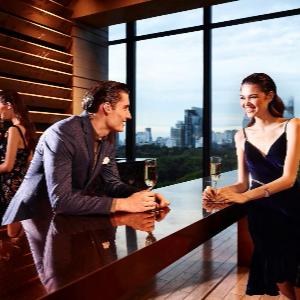 With sweeping panoramas over Lumpini Park, MIXO bar is a stylish social lounge, the perfect spot for high tea nibbles, casual meets, and endless park-and-skyline views. As night beckons, DJs spin tunes to set the mood for lounging and mingling, accompanied by seductive cocktail creations. The food quality was low thus only finished half of the set. There were only 2-3 tables (not so busy) but the staff were nowhere to be seen some of the time, which we had to wait for a while when we requested service. Thought that we had 50% discount with accor membership card but it was only upon we paid the bill we noticed it was just 10% off. With this amount of money we had a lot of better choices. Very disappointed! A nice late afternoon Hi-tea at Mixo. The lemon grass tea was perfect. The staff is dedicated and courteous. Bravo!